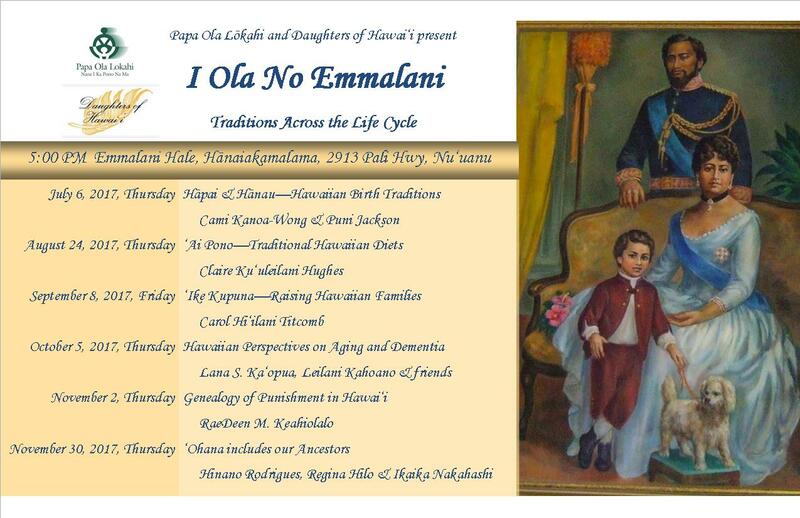 Papa Ola Lōkahi & Daughters of Hawai‘i present an educational series in Hawaiian health traditions across the life cycle in honor of Queen Emma. 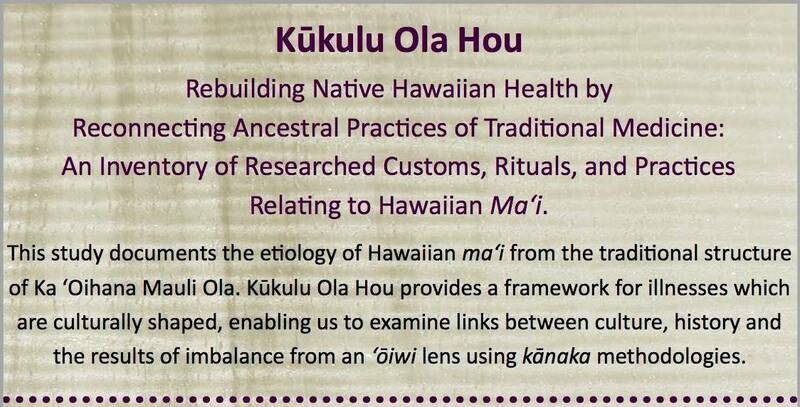 All presentations will be held in Emmalani Hale at Hānaiakamālama in Nu‘uanu Valley, O‘ahu. Join us! Rat lungworm is caused by a parasitic nematode (roundworm parasite) called Angiostrongylus cantonensis. The adult form of A. cantonensis is only found in rodents. However, infected rodents can pass larvae of the worm in their feces. Snails, slugs, and certain other animals (including freshwater shrimp, land crabs, and frogs) can become infected by ingesting this larvae; these are considered intermediate hosts. Humans can become infected with A. cantonensis if they eat (intentionally or otherwise) a raw or undercooked infected intermediate host, thereby ingesting the parasite. For more information on the life-cycle of A. cantonensis, visit the CDC website. SIGNS & SYMPTOMS. This infection can cause a rare type of meningitis (eosinophilic meningitis). Some infected people don’t have any symptoms or only have mild symptoms; in some other infected people the symptoms can be much more severe. When symptoms are present, they can include severe headache and stiffness of the neck, tingling or painful feelings in the skin or extremities, low-grade fever, nausea, and vomiting. Sometimes, a temporary paralysis of the face may also be present, as well as light sensitivity. The symptoms usually start 1 to 3 weeks after exposure to the parasite, but have been known to range anywhere from 1 day to as long as 6 weeks after exposure. Although it varies from case to case, the symptoms usually last between 2–8 weeks; symptoms have been reported to last for longer periods of time. TRANSMISSION. You can get angiostrongyliasis by eating food contaminated by the larval stage of A. cantonensis worms. In Hawaii, these larval worms can be found in raw or undercooked snails or slugs. Sometimes people can become infected by eating raw produce that contains a small infected snail or slug, or part of one. It is not known for certain whether the slime left by infected snails and slugs are able to cause infection. Angiostrongyliasis is not spread person-to-person. DIAGNOSIS. Diagnosing angiostrongyliasis can be difficult, as there are no readily available blood tests. In Hawaii, cases can be diagnosed with a polymerase chain reaction (PCR) test, performed by the State Laboratories Division, that detects A. cantonensis DNA in patients’ cerebrospinal fluid (CSF) or other tissue. However, more frequently diagnosis is based on a patient’s exposure history (such as if they have history of travel to areas where the parasite is known to be found or history of ingestion of raw or undercooked snails, slugs, or other animals known to carry the parasite) and their clinical signs and symptoms consistent with angiostrongyliasis as well as laboratory finding of eosinophils (a special type of white blood cell) in their CSF. TREATMENT. 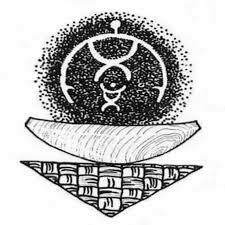 There is no specific treatment for the disease. The parasites cannot mature or reproduce in humans and will die eventually. Supportive treatment and pain medications can be given to relieve the symptoms, and some patients are treated with steroids. No anti-parasitic drugs have been shown to be effective in treating angiostrongyliasis, and there is concern that they could actually make the symptoms worse because of the body’s response to potentially more rapidly dying worms. Persons with symptoms should consult their health care provider for more information. PREVENTION. To prevent angiostrongyliasis, don’t eat raw or undercooked snails or slugs, and if you handle snails or slugs, be sure to wear gloves and wash your hands. Eating raw or undercooked freshwater shrimp, land crabs and frogs may also result in infection, although, there has not been any documented cases in Hawaii. 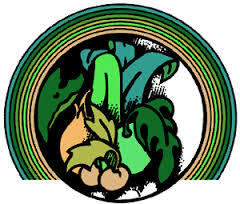 You should also thoroughly inspect and wash fresh produce and vegetables, especially if eaten raw. Eliminating snails, slugs, and rats founds near houses and gardens might also help reduce risk exposure to A. cantonensis. When preparing food for cooking, any suspect food products should be boiled for at least 3 to 5 minutes, or frozen at 5°F (15°C) for at least 24 hours; this will kill the larval stage of the worm. REPORTING. HDOH requires that clinicians report patients with eosinophilic meningitis, i.e., signs and/or symptoms consistent with meningitis plus eosinophils in the cerebrospinal fluid (CSF) without possible alternative causes, including CNS infection with other microbes, reaction to foreign material in the CNS (e.g., intracranial hardware or myelography dye), medications (e.g., intrathecal vancomycin or gentamicin), neoplasms, multiple sclerosis, and neurosarcoidosis by calling (808) 586-4586. 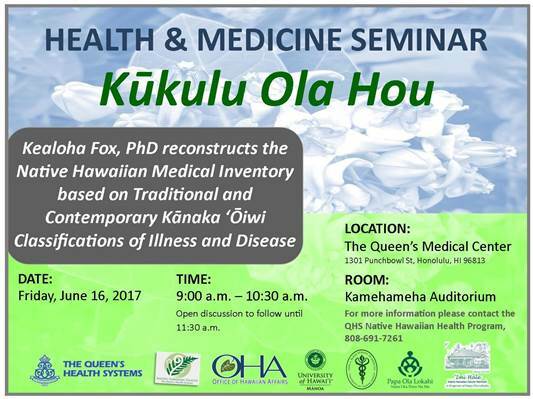 Mahalo to the Hawai'i State Department of Health for the above comprehensive information about rat lungworm disease. 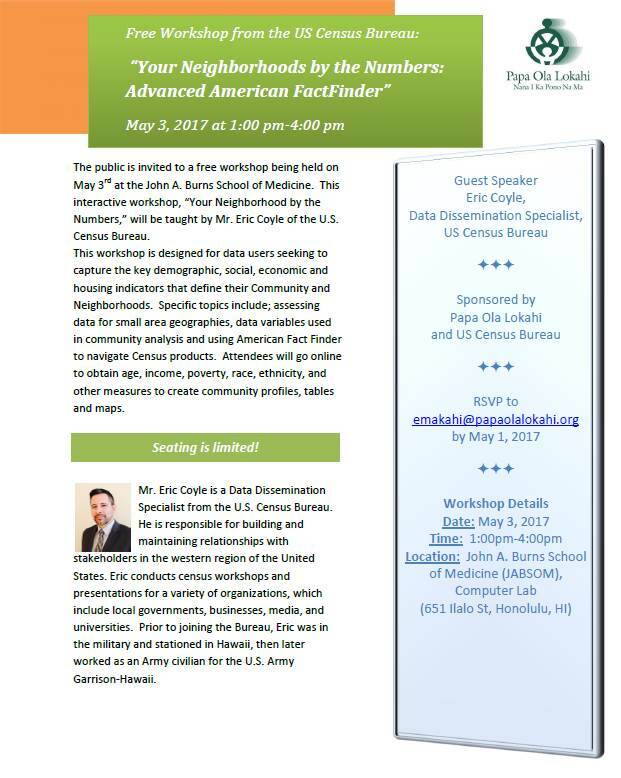 Papa Ola Lōkahi presents "Your Neighborhoods by the Numbers," a free interactive workshop on May 3, 2017 taught by Mr. Eric Coyle of the U.S. Census Bureau. 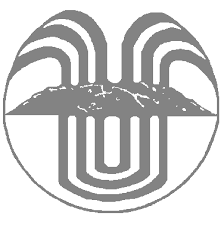 Papa Ola Lōkahi is a Census Information Center, designated by the U.S. Census Bureau, specializing in Native Hawaiian and Pacific Islander communities..